I am committed to actively assisting clients through every aspect of healing and maintaining wellness. As each person is unique in body, mind, emotions, life circumstances, preferences and needs, I take a customized approach. View a short introductory video. I give my personal and professional best in all my treatment modalities and techniques, always with respect and compassion, in a peaceful and safe space. As with my approach to healing, my logo unifies the physical, emotional and energetic levels of the body. Blue symbolizes protection, liberation and healing; Red symbolizes unconditional and divine love; and Gold symbolizes wisdom and abundance. When these energies are combined, perfect alignment and balance is achieved. "I have had massages in Europe, Asia and the US. 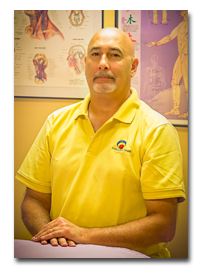 Without doubt, Leonardo gives the best deep tissue massage that I have had." A massage with Leonardo invariably leads to deep healing, a reconnection of the mind and the body, and a reminder of the importance of extraordinary self care. He is simply the best. Leonardo has treated me for five years for chronic Thoracic Outlet Syndrome and repetitive strain injuries. I have less pain and fewer muscle spasms and stiffness as a result of his myofascial release, trigger point and accupressure techniques. Compared to the average spa therapist, Leonardo’s treatments are more thorough and result in significantly more pain relief. In addition, he is very kind, caring, and professional. I have been going to Leonardo for massage therapy for several years now. I feel very fortunate to have found a true healer of his ability. From the initial consultation to the ongoing communication and his technical expertise, the experience is wonderful. Throughout the session you experience kindness, respect and excellence of ability. I have referred my daughter and every friend who comes into town to Leonardo. It is his innate nature that creates a wonderful place for healing. After spending 20 years in engineering and business, I knew that holistic and alternative medicine was my calling. In 2001, I graduated with an Associates Degree in Natural Health Science from Florida College of Natural Health, with a concentration in Advanced Therapeutic Massage. Before opening my private practice in 2004, I worked at Contour Day Spa, NV Wellness Center and Spa Atlantis. Thai Massage, certifications from the Vedic Conservatory and from Universal Touch, Inc. I speak English and Spanish, and live in West Boca Raton.